Aaron Neuwirth reviews Damsel, a quirky western featuring Robert Pattinson, Mia Wasikowska, and a miniature horse. I find it fascinating when it comes to placing a curious eye on the western. While there are many facets of the genre, especially in the way it has been reexamined and dissected by various filmmakers over the years, applying a sense of quirkiness still tends to feel fresh. 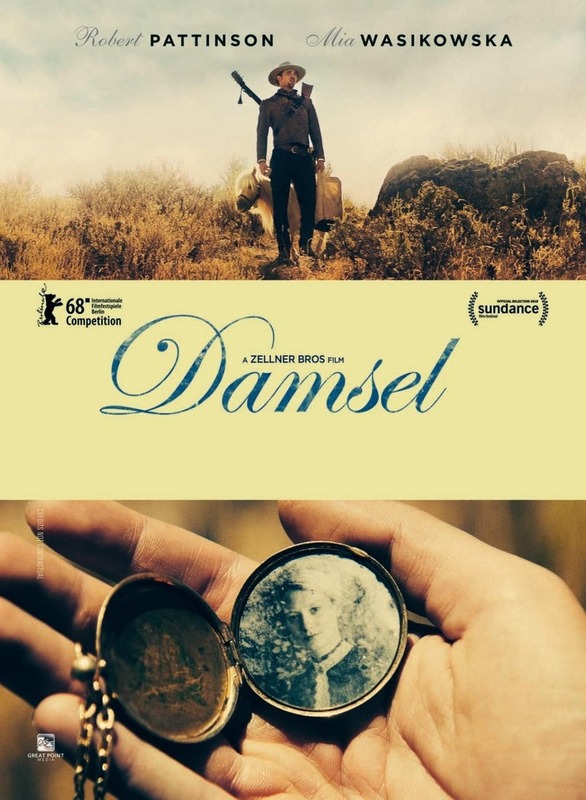 Damsel falls into this realm, as it’s not absurdly over the top like Blazing Saddles or other pure western comedies that are not nearly as good as the Mel Brooks classic. Instead, the Zellner Brothers-directed film comes closer to the idiosyncratic tone of the Coen Brothers’ True Grit or John Maclean’s Slow West. The result is something of a bizarre motion picture that has its own way of de-glorifying certain myths of the west. Any viewer should already be aware that Damsel won’t be the typical sort of film by its opening. Robert Forster arrives as an old Preacher reflecting on the path he has taken while waiting for transportation. It is here we are introduced to Henry (David Zellner, who has quite the role to go along with his directing duties), the drunkard that will be more of a presence later on. That’s merely a prologue, however, as the real story involves Robert Pattinson’s Samuel Alabaster’s, a young man on a quest to rescue the love of his life, Penelope (Mia Wasikowska). He arrives in an unspecified part of the west via boat, with a rifle, guitar, wedding ring, and a miniature horse named Butterscotch. 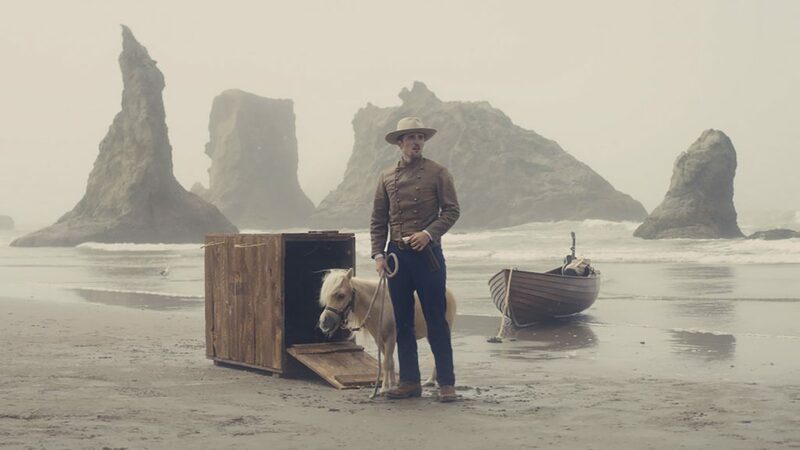 When a miniature horse is brought into the mix, you know you’re in for something unusual, and that is what Damsel turns out to be. This is the sort of film that opens with an interesting look at the west from a certain perspective and proceeds into an opening titles sequence that credits The Octopus Project for the score. That’s not to call out The Octopus Project as being a band incapable of delivering what we would expect from a score for a western, but given where things go, the level of quirkiness should not be unexpected. What will be unforeseen are the various turns this film takes. Damsel may present a familiar sort of story, but even the title should be a clue that not all is what it seems. Thanks to an off-kilter sense of humor about things, the line drawn between the comedic and the dramatic becomes quite thin in a manner that eventually shifts the entire direction of the film. It is at the point the film begins to dig into what kind of story it aims to tell. A lot of the success rides on the actors. As anyone should expect, at this point, Pattinson is terrific. Taking a giant shift from his excellent turn in the Safdie Brother’s Good Time, Pattinson is superb as the dunderheaded, love-struck fool in this film. The physical comedy Pattinson manages to mine out of carrying both a rifle and a guitar allows the audience to see how much slapstick humor is taking place at times. Between him and the odd rhythms both Zellner brothers find in the roles they have in this film, there’s a good amount of smiling that will take place during a movie where the stakes occasionally get a bit higher than expected. Wasikowska is another casting win, which is important, as she’s the sort of actress you need to stress what kind of idea this film is trying to play at. Regardless of how dire Penelope’s situation may be, there’s certainly this level of frustration that any viewer should pick up on concerning how she must handle the various men that enter her life. If past revisionist westerns had a way of exploring the psyche of the men responsible for so much carnage in their time, here’s a modern western that similarly goes about examining the role men occupy when courting or perusing a lady. In addition to the spirals towards self-reflection Damsel has, it is important to note how great this film looks. While the movie purposely does not name a year or place the story is set, cinematographer Adam Stone does a wonderful job capturing the feel of the west in his focus on the scenery. Filmed in Utah and Oregon, there’s an interesting sense of place to go along with the journey these characters eventually go on. It also doesn’t hurt to see the film find so much beauty in the horses, both regular and miniature. Damsel may lean on its eccentricities in a manner that will rub some the wrong way, but I found the film pretty delightful. The unpredictable nature of the story allowed me to be even more engaged than I would have expected, but the film’s sense of humor is really what hooked me. Along with having one the darkest moments work as one of the funnier sight gags this year, Damsel has plenty working for it to serve as a modern western with interesting meanings to eventually engage with. It only helps to see a cast willing to go a little wacky when they need to.